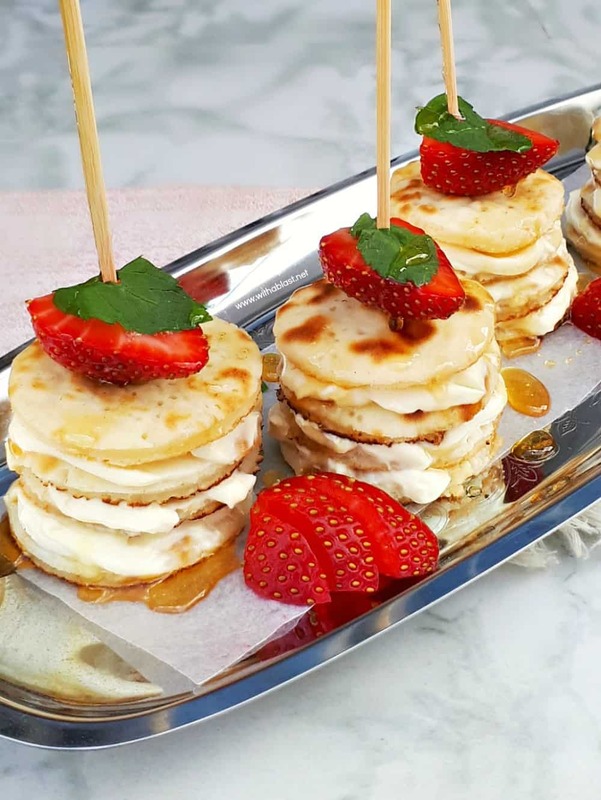 Deliciously Mascarpone Filled Mini Pancakes Stacks are perfect for a special breakfast, brunch or even a sweet treat. Perfect with Strawberries and drizzled with Honey! 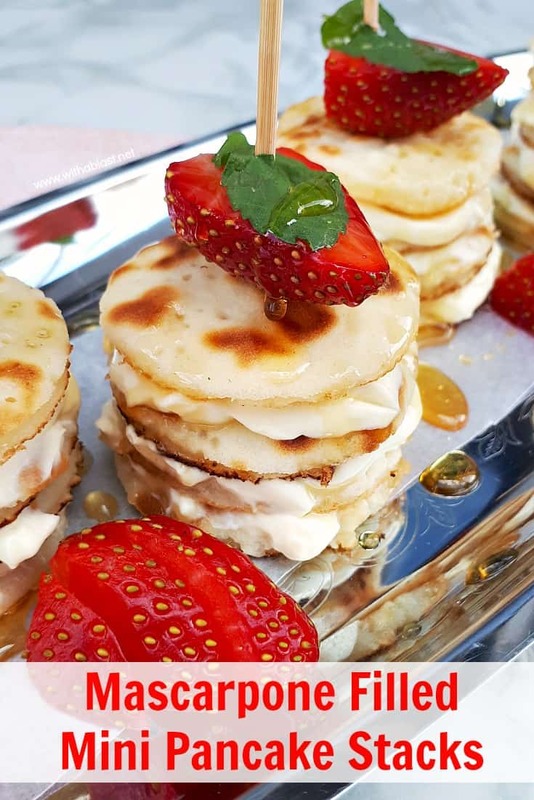 If you are tired of serving the same pancakes for breakfast every time, try these Mascarpone filled mini Pancake stacks ! It might look like a lot of “extra” work, but it really is not. And besides you can make the pancakes ahead of time, or use leftovers from a previous large batch. Use plain pancakes, unless you have flavored pancakes which would go well with Strawberries. The Mascarpone can be used plain or lightly flavored. However, do keep in mind the Honey or syrup which you will drizzle over. You do not want two flavors working against one another ! 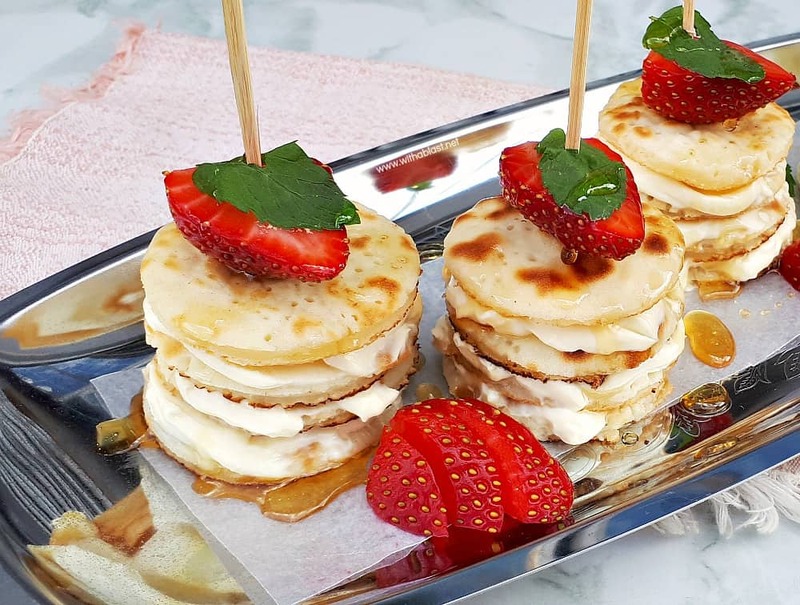 These mini Pancake stacks are perfect to serve on a special morning for breakfast or brunch. Think Valentine’s Day, Easter, or a Birthday treat. For Valentine’s Day you can always use a heart shaped cookie cutter (about the same size as per the recipe) and it would look so cute ! 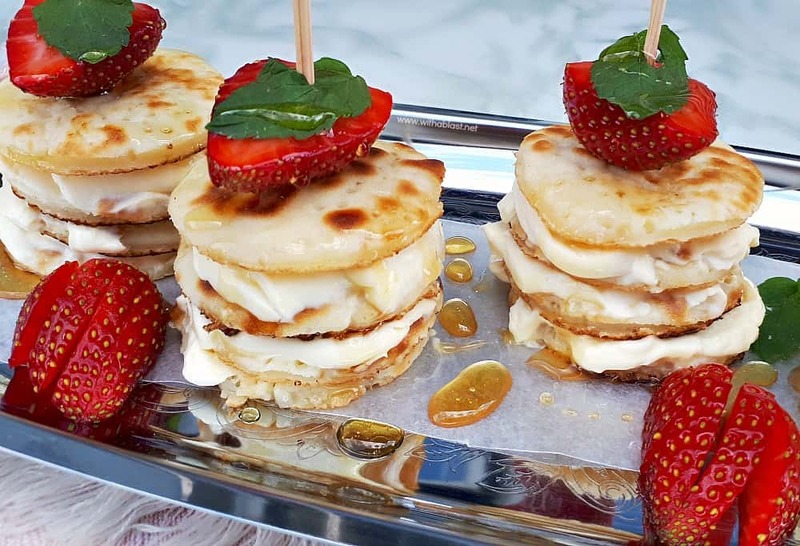 I serve the Mascarpone filled mini Pancake stacks cold in order for the Mascarpone not to get runny, but if you can serve quickly, warm is just as delicious. 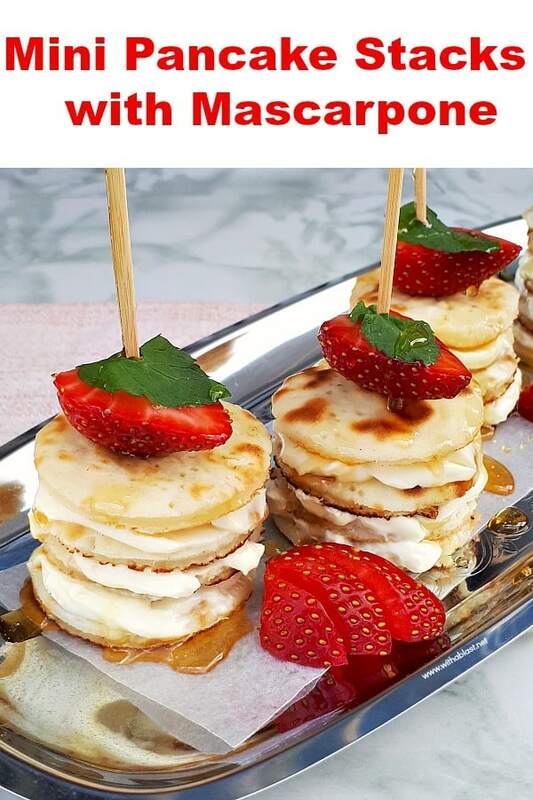 An easy idea to transfer the stacked mini Pancakes to a serving plate, is to use a spatula. Or you can simply stabilize the stack by holding the bottom with your finger when transferring. Plain or flavored Mascarpone ? Well, again this is a personal choice. I prefer plain and then we can go crazy with the Honey or syrup drizzled over. Besides, each person adds their own quantity of drizzling. And I have seen some people really go overboard with syrups over pancakes ! How many Pancake stacks per person ? If serving as a side (part of) a larger bacon and eggs kind of breakfast, one stack is more than enough. However, if you are only serving the Pancake stacks, I would say no less than three per adult and one or two per child (depending on their age). I have to admit, I have never (for breakfast or brunch) served the mini Pancake stacks on it’s own. It is always part of a larger breakfast as we are a bacon and eggs loving family. One last reminder, these little treats are not only for breakfast or brunch ! Serve them as part of your sweet party platter, or a tea time get together as well. Even the leftover pancakes from this morning’s breakfast can be used and then serve the stacks for dessert. 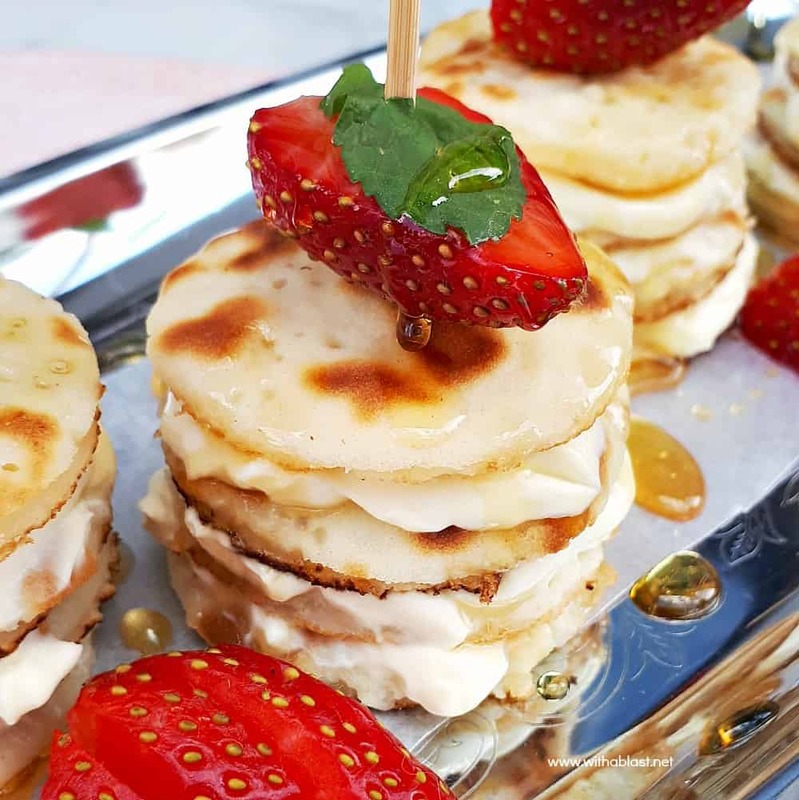 Mascarpone Filled Mini Pancakes Stacks are perfect for a special breakfast, brunch or even a sweet treat. Perfect with Strawberries and drizzled with Honey!